LeoVegas is one of the biggest mobile casinos around, but they are not only an online casino. They offer a huge variety of sports to bet on and also got into esports now. The Swedish bookmaker partners with famous brand ambassadors and are really doing a great job with their mobile version and the LeoVegas app. Their website has a unique design and is simple to use and even for people that are new to betting it is a fun experience without any complications to get into esports betting at LeoVegas. LeoVegas was established in 2012 and are focusing on the mobile version ever since. No wonder they won several awards for their effort and were named brand of the year several times at the EGR awards. With their growing sports section and their sense of innovation, it is not a surprise that they are doing their best to be up to date and add esports betting to their portfolio. They are offering more and more promotions and are expanding their esports offers permanently. Esports betting at LeoVegas is going to be exciting. You will find out! Esports are new to the LeoVegas portfolio. You can find a growing amount of games to bet on, and most people still do not know about that feature at LeoVegas. They mainly cover bigger leagues and the more popular tournaments, but they are expanding their offers. 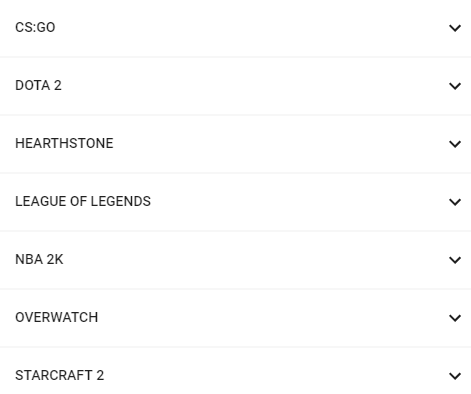 You can currently bet on League of Legends, Dota 2, Starcraft 2, Overwatch, NBA2k and CSGO. They are getting into smaller tournaments as well, and the options for esports betting at LeoVegas are continually increasing. The bookmaker offers mainly map bets for esports. You can use them to bet on the performance on a specific map or on the team you think is most likely to win the map. You can also choose to bet on a combination of bet wins. These map bets really make the tournaments interesting. And it helps to know about the shape of the Dota 2, LoL, CS:GO or Starcraft 2 Teams to have even more fun. Live betting is a way to make your esports betting even more exciting. As the name implies, you can place the bets while watching a match live. So you can put your esports bets based on the events happening and on the performance of the team. LeoVegas is not just a bookmaker for esports betting, they provide many other sports to bet on and an enormous online casino. You can bet on Football, American Football, Tennis, Basketball, Baseball, Badminton, The UFC/MMA, Motorsports, Surfing and many more. They even offer bets on sports, that might look like a niche, but you can still bet on them. One of the most essential parts of LeoVegas is, of course, the online casino and especially the mobile casino and app. You can play Roulette, Black-Jack, Slots and much more. They also offer live tables with real croupiers with whose you can even chat and feel like in a real casino. So if you ever need a break from esports betting at LeoVegas, they have got you covered. LeoVegas covers mainly the more significant events and tournaments but comes up some niche tournaments sometimes as well. They offer great odds for CS:GO bets or LoL betting, and they keep improving. The bookmaker is a solid choice, and their odds are getting more and more attractive. It is a good idea to start esports betting at LeoVegas given their odds for the important tournaments. LeoVegas offers a generous welcome bonus that can be used for your Esports bets. They will boost you first two bets up to 100%. That offer is tied to a max bet of 5 Euros, but it is a great way to get started and get to know the bets. Currently, they do not offer any special bonuses for esports betting at LeoVegas, but they have a lot of special sports promotion, and some of them can be used for esports as well. And who knows they might come up with something soon. Just have a look at their terms and conditions and be aware that the promotions might vary from region to region. The bookmaker accepts a big range of payments methods so you will find the most suitable one for you. You can use credit cards, like Visa and Mastercard. You also have the option to use the safe method Paysafecards or use the fast and direct e-wallets Neteller and Skrill for your transactions. The transactions are handled quickly and using the e-wallets even withdrawals can reach you in less than a day. If you ever need assistance the LeoVegas support is happy to help you.